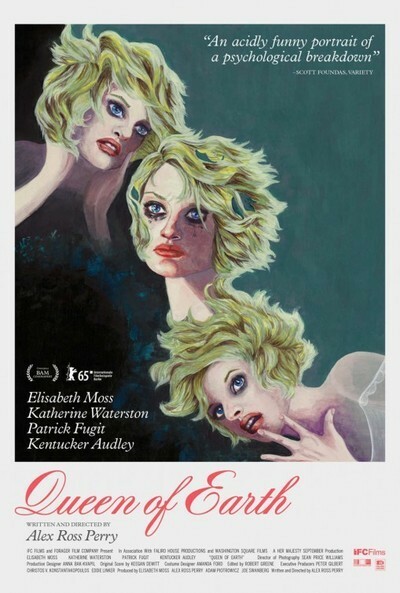 Alex Ross Perry’s “Queen of Earth” is as unsettling as any horror film that you’ll see this year but it so by virtue of its filmmaking and its performances instead of a twisting and turning narrative. Echoing dramas of internal conflict turned into threats of physical danger like “Persona” and “Repulsion,” Perry explores the concept that it is the human mind and its emotional undercurrents that is the most terrifying thing in the world. Anchored by incredible performances from Elisabeth Moss and Katherine Waterston, this is one of the most mesmerizing pictures of the year. “Queen of Earth” opens with a tone-defining close-up of Catherine (Moss). Her makeup has run into bags around her eyes, her hair is disheveled, and she is emotionally drained. It is brutal, unsparing and direct. Perry doesn’t pull back and offer much coverage, just a couple close-ups of Catherine’s now-ex-boyfriend James (Kentucker Audley). He is breaking up with her, and she is not taking it well, noting that this is the kind of emotional blow, coming shortly after the death of her father, that will devastate her. As we will quickly learn, Catherine was one of those people who was deeply co-dependent on two men in her life—her father and her boyfriend. When the former dies and the latter leaves her, she will be totally adrift and border on unstable. To try to bring her back to Earth, friend Virginia (Waterston), Ginny to her friends but only her friends, invites Catherine to spend the weekend at her family’s cabin in the woods. Editor Robert Greene deftly intercuts back to a similar weekend a year ago in which the roles were reversed—Catherine was there with James and Virginia was the lonely third wheel, resentful that a girls’ weekend turned into a triangle. Almost subconsciously (but maybe not so sub-) creating the same dynamic a year later, Virginia invites her neighbor Rich (Patrick Fugit) to spend time with her and Catherine on this sun-kissed weekend. Catherine hates Rich. It could be just because he represents a gender she doesn’t feel like seeing right now, or that, like Virginia last year, she resents her emotional healing being invaded. If this all sounds like the set-up for a mumblecore drama, you’re not wrong. And yet “Queen of Earth” has a very different tone than the work of Joe Swanberg. First, there’s the unusual friendship between Virginia and Catherine, two people who can be devastatingly, dangerously honest with each other. They take stabs at each other to see how much the other one will emotionally bleed. They are kind of awful to one another in the way friends know the buttons to push that enemies do not. Ginny accuses Catherine of living in her father’s shadow and tied to her ex-boyfriend, almost as if she’s pushing her friend deeper into depression, knowing she has to face some realities before she can return to normalcy. And Perry very carefully focuses more often on the listener, more interested in the impact of what’s being said on the person who hears it than the act of saying it. That impact pushes Catherine closer to the edge of sanity. She tells a visitor one night, “You know, I could kill you and no one would know,” and Moss delivers the line with just the right mix of humor and truth, as if she’s only half-kidding. Perry also uses ominous music throughout “Queen of Earth,” much like the psychological thrillers from the ‘70s that the film sometimes cribs from, raising tension through score as much as action. We feel something bad is going to happen. Will Catherine kill herself? Kill someone else? Her world has shattered and every way in which she defines herself (she even worked for her father) is gone. As she says, “I don’t really feel like I exist anymore.” And Ginny says she cares about Catherine’s recovery, but does she? “Queen of Earth” is terrifying because it is so emotionally unmoored—Catherine is a character with little reason to care about anything or anyone, and Perry and Moss convey the danger of that brilliantly. Moss has been a TV awards regular for her great work on “Mad Men,” and killed it last year in “The One I Love” and Perry’s “Listen Up Philip,” but this is the best work of her career. She is both shattered and terrifying, the kind of person you want to help but who you’re a little scared to talk to. She plays Catherine as totally psychologically untethered and drifting further away from normalcy, but she doesn’t chew the scenery in doing so, grounding Catherine’s breakdown in realism. Waterston is just as good, proving that breakthrough in “Inherent Vice” last year was no fluke. Her third act work here is particularly terrific, as Ginny starts to realize that Catherine may not be exactly where Ginny was last year—she’s further down the road of depression. Like the emotional turmoil of real heartbreak, “Queen of Earth” refuses easy answers. It will frustrate some viewers in its lack of conclusions, but Perry is more interested in tension than pay-off. Those hazy, uncertain days of our lives when our definitions of ourselves have to change and we’re not even really sure who our friends are or how we feel about them makes for remarkably ambitious territory for a filmmaker to explore. Alex Ross Perry is a remarkable filmmaker.